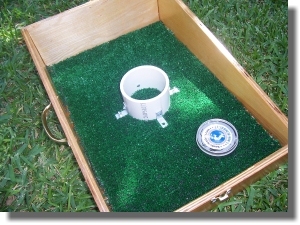 These washer game plans are for creating a two-piece portable wooden washer game set. 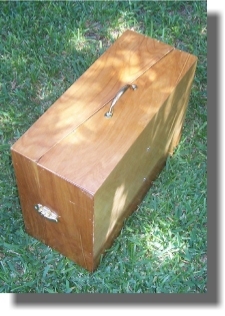 This woodworking project is small enough to be built from scrap material, that you might have left over from a previous project. This game is called the washer "box" game. 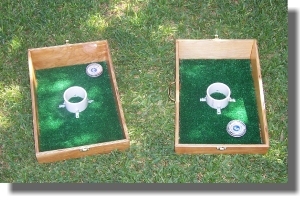 There are also the three holed washer board, the one holed washer board, and the in-ground "pit" game. They each have their own specific rules. The rules for this game are located here. One piece of 3/8 plywood 4 feet wide by 2 feet long. Eight inches of 3 inch PVC pipe. The tools that you will need are also relatively few. 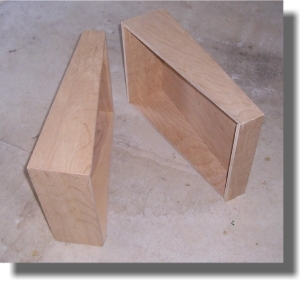 To build the base parts, cut the 3/8 inch plywood into the following sized pieces. The dimensions provided are measured from the "long points" of the mitered pieces. 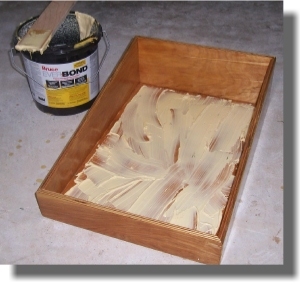 Assemble the 6 cut pieces of 3/8 inch plywood together to create a rectangular box (that has no opening). 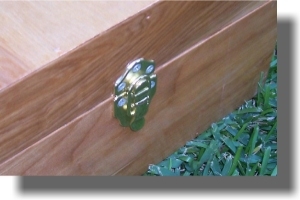 Use Carpenter's glue and a brad stapler to assemble the pieces. I highly recommend thorough sanding of the pieces of plywood before assembling them. You don't need to do it for aesthetics, but plywood often has splinters that can be quite painful if they aren't smoothed off before handling. Once assembled, measure 2 inches down from one of the 8 inch dimensions of the box, and do the same on the opposite end, but in reverse. Draw a line to connect the points. Flip the box over and make the same marks on the other side. Using a circular saw, cut along the lines that you just made. The idea is to create two trays for the washer game with equally sloping sides as shown. Polyurethane the two trays to seal and protect them. 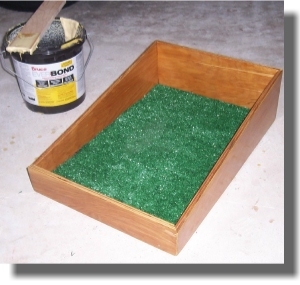 Cut two pieces of the green turf to match the bottom of the inside of the bases and glue in each piece. Cut the 8 inch piece of PVC pipe into two equal pieces. Using the 1 inch "L" brackets and 8mm nuts/bolts, attach the 4 inch PVC pipe to each base part. This will require drilling 3/16 inch holes as needed in the PVC pipe. Drill the holes so that when you bolt on the "L" brackets, they are flush with the bottom of the 4 inch piece of pipe. Position the assembled PVC/"L" bracket parts in the center of the bottom of each base. Using the holes in the "L" brackets as a guide, drill additional 3/16 inch holes through the 3/8 plywood base and the fake turf grass. Attach using the 3/4 inch long 8mm nut/bolt combinations. These washer game plans are basically complete, but it would travel much easier if you could attach the base parts together and have a handle to carry it. That's where the brass pull and the clasps come in. Attach them as indicated. Success! Your washer game is now completed! Leave Washer Game Plans and return to myCarpentry Home.